PRIVATE MOUNTAIN RIVERFRONT ESTATE! 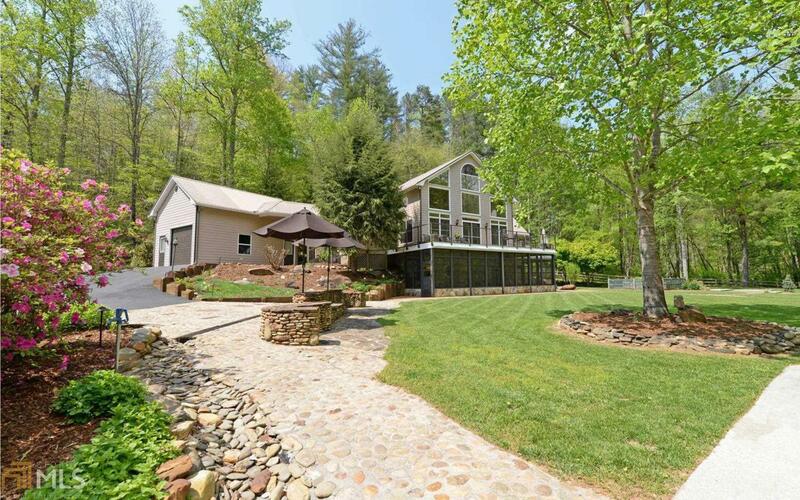 This private estate offers end of the road privacy, gated entry, a park-like setting w/ concrete walkways throughout the 7.69 acres, over 1,000 feet of wide river frontage on the rushing Hiwassee River, a main house w/ an open floor plan, 3 spacious bedrooms including a huge master on the main level, 3.5 baths, grand rooms for entertaining, floor to cathedral ceiling stone fireplace, walls of windows creating a light atmosphere & allowing amazing views, wine tasting room, in-house theater, large decks, stone walkways, artist studio/solarium & mature flower & organic gardens, security system, a guest or caretaker house w/ 2 bedrooms & 2 baths. Each suite has it's own entrance so could easily be used for caretaker & guests.